On a grey November day in London we met a man who showed us a photo of a of a sail boat floating on a beautiful blue lake surrounded by green hills and said, “come to Paradise in Portugal”. How could we refuse? 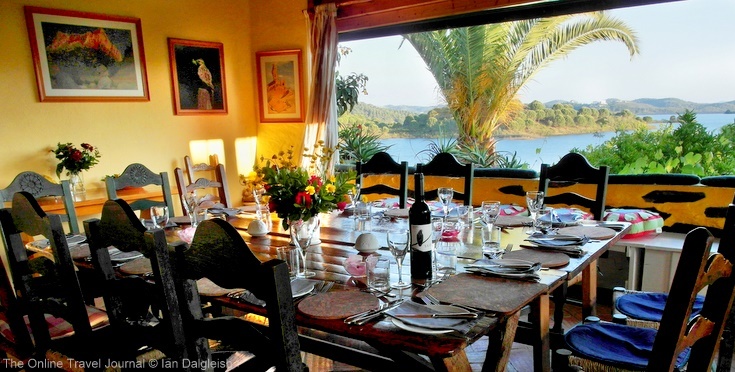 Quinta Do Barranco da Estrada is a special place; it sits on a promontory overlooking the lake just 1 1/2 hours by car from Faro , 2 1/2 from Lisbon, in sparsely populated rural surrounds you don’t immediately associate with southern Portugal. We had already had a sample of the sort of service our host, Frank gives his guests – an email with directions for those of us arriving in a hired car on how to the avoid the electronic only toll roads due to be introduced (there’s currently no tidy way to pay for these if you hire a car) – it’s the kind of thing Frank thinks of and acts on. Leaving the built up coastal strip of the Algarve behind we headed inland towards the mountains taking a more roundabout route to visit the mountain town of Monchique on the way. To the north as we dropped down into the Lower Alentejo pine trees and stands of eucalyptus gave way to gentler rolling countryside awash with spring flowers; we pulled over to take a photo, shut off the engine and found ourselves in silence with only chirpping insects and the odd murmur of a breeze. We hadn’t believed Frank when he said there was hardly any traffic, but it’s true, passing less than a handful of cars we reached the signpost at the ‘Top of the World’ and turned off onto dirt track for a gentle 4km roller coaster ride along the spine of the hills, finally when there really wasn’t anywhere else to go coming to rest besides the Quinta. Four assorted dogs rush out to greet us, as welcoming to guests as Frank and his family – set off for a walk and they’ll fall in and keep you company along the way. The Quinta is ranged along a paved terrace looking out over the lake; a neat row of verandahed rooms then slightly apart – fronted appropriately by a courteous green parrot – the reception, drawing room and dining room with more accommodation beyond. When Frank arrived here in 1987 in an old London bus, no less, there were just two smaller buildings. First he created the terraced sub tropical garden, now lush and a haven for birds and creatures of all kinds, then over the years with the help of family and friends, much building and rebuilding the Quinta emerged into the 10 room guesthouse it is today. We are in the honeymoon suite, white walled, brick floored with a traditional heavy beamed roof, lined with reeds under terracotta tiles. The bed linen is lovely, a beautiful white embroidered quilt – there are fresh flowers, woven floor rugs and a wood burning stove for the cooler months. It’s ensuite with a shower over the bath and hand filled toiletries in a basket. As it doubles as a family room there’s also a little den of a room with bunk beds. And outside a little private terrace furnished with another ‘must’ in paradise – a hammock. Back in the dining room sitting by the open window with ‘that view’, over a cup of tea we meet Daniela, Frank’s wife who besides playing a large part in ensuring the smooth running of the Quinta is responsible for the homely touches – the fresh flowers, a bowl of kumquats from the garden …. Frank has been a birding guide for many years and wants to know if we would like a day’s birdwatching in the Alentejo – from all that we’ve gleaned of Frank’s knowledge it seems like an opportunity not to miss – ” great Frank responds, breakfast at 5.30am then”. Before dinner there is time to savour the feeling of being truly away from it all; we wander through the garden with its secret feeling places, and marvel at the work and stone that went into its making. Frank did tell me how many tons of rock he has moved to create the garden and buildings – I forget the figure but it’s a lot. Frank makes use of ruins, on one occaision recycling an entire building no longer wanted by its owner. Quinta Do Barranco da Estrada is not only lovingly created but green as well . Conciousness of the environment spreads to power supplies too with solar cells providing 3/4 of the electricity requirements for the Quinta . Another bank of solar cells provides power to pump water from the reservoir to a tank above the quinta and ingeniously any overflow trickles back down the hill watering the garden en-route. Oh and if you’re taking a shower you can rest assured it’s likely the sun has provided the energy to heat the water too. Down at the water’s edge there is a pontoon you can swim off and watercraft -canoes, a sailing boat and pedalos to take to the water on. Confessing to never having been in a pedalo before Ian takes me for a spin on the lake – looking back you can see just how idyllic the spot is with the Quinta nestling amonst the greenery showing flashes of red tiled roof and white washed wall. Dinner is a convivial affair with other guests, Frank and Daniela and their children around a characterful wooden table (actually two tables with history). The food is good: bread, cheese and olives to dip into, a starter of ham and melon, grilled fish followed by a delicious tart. Drinks are available from the bar; the wine list is an original, ornithologically choosen, the criteria being a bird on the label and a real cork. Between them Frank and Daniela can converse in English, German French and Portuguese so connections are easily made. There’s much good natured banter over the best bird spot of the day – it’s the sort of place guests leave exchanging addresses and inviting each other to stay. Darkness falls over the lake outside as the conversation around the table continues over tea and coffee, the order is taken by Daniela & Frank’s youngest daughter who reels off all the options including mint tea made with fresh mint from the garden. We take our leave around 10pm with an early start ahead of us and walk the few steps to our room pausing on our little patio, we can see no lights out over the water, no sound of traffic at all, just the song of a nightingale. Other guests had plans to take a walk in the surrounding countryside – Frank has compiled directions for several rambles – or just to relax and enjoy the peace. A Shiatsu massage from Daniela who is a qualified practitioner in this ancient Japenese healing art is another option. I find myself thinking about what a great spot this must be for families, room to run about and have mini adventures, watery activities on hand like sailing, rowing and fishing – a place where imagination can take hold. Indeed for anyone who enjoys the natural world, wants to get away from it all, I reckon this unique, rural retreat will come close to Paradise. fellow guest Carolyn Tong told us – going on to explain that her husband Mike met Frank at the Rutland Bird Fair, then a few weeks previously reading an article in the Independent on walking in the Alentejo had recognized Quinta do Barranco da Estrada as one of the bases. A few emails were exchanged, all very straightforward, and here they were. Our stay was provided courtesy of Quinta Do Barranco da Estrada. A wonderfully accurate article, yet it still does not do the Quinta real justice. I have been visiting Frank and the family at the Quinta since 1990 and have even helped shift some of the rock mentioned in the review. To get a real sense of how incredibly beautiful and special this place is, you really have to visit. Trust me, you will not be disappointed.